Theatre and science have long been regarded as polar opposites (with the possible exception of the operating theatre!). But over the last decade or so, the boundaries between science, technology, and the performing arts have slowly begun to dissolve. Science takes the stage in a big way in the play False Peach, which mixes live performance with artificial intelligence software. 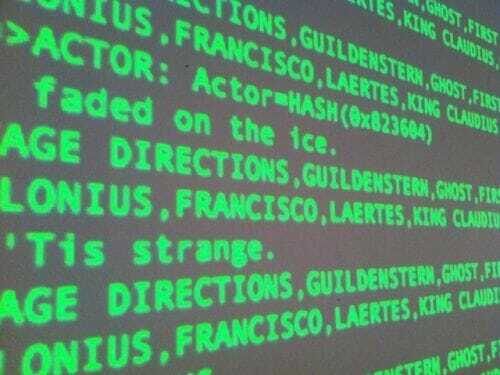 In the play, lines of computer code play a central role in the retelling of one of Shakespeare’s most famous plays: Hamlet. It uses a computer algorithm (a list of rules that determines the path a computer program takes) that recombines every aspect of the theatre classic to make new scenes using the existing script. Each word in the play has been assigned its own piece of code and the computer program then puts the pieces of code together in a new sequence. The program also directs the set, rigging, stage lighting and actors. Some lines are read and performed by digital voices on computers, others by actors on stage. The end result? A unique and different performance every night – created and directed by an artificial intelligence. Photograph 51 is a very different kind of play, but also showcases the interesting combination of theatre and science. It tells the story of British scientist Rosalind Franklin, who helped discover the double-helix model of DNA in the early 1950s, and tackles the somewhat controversial topic of women in science. Both plays are being shown in Seattle, US, which is currently seeing a big push to use the arts in efforts to expand science, technology, engineering, and math education. They show that art and science have more in common than people think, and when used cleverly, can mutually enrich one another.